Last week marked the fifth anniversary of Hurricane Sandy—at the time, the second most damaging hurricane to hit the United States. Tens of billions of dollars worth of infrastructure was damaged, and the rail system into New York City is still being fixed. As it does after each catastrophic disaster, the government evaluated the response and recovery and made recommendations on how to improve efforts for future disasters. Unknown to many, that future was the 2017 hurricane season. This year has seen many tragic firsts for national disasters. 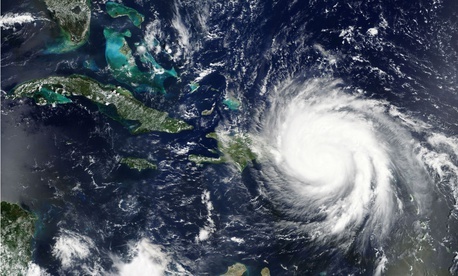 Four major hurricanes came ashore within six weeks in the Gulf of Mexico and Caribbean, representing a new and tragic record. The resulting disasters affected an estimated 25 million people living in the paths of the storms, causing death, injury and illness, and destroying or damaging homes and businesses. An estimated 3.5 million people have registered for federal disaster assistance so far this year. The devastation will be long-lasting for many Americans. It will be months before the majority of people in Puerto Rico and the U.S. Virgin Islands have power and clean water. Large numbers of homes and buildings have been destroyed or remain uninhabitable. And the destruction wrought by hurricanes is only part of the story. The deadliest wildfires in California history struck in October, killing dozens and wiping out entire neighborhoods. Floods, fires, and other disasters across the nation, though smaller, had devastating impacts on local communities. Were we as prepared as we needed to be? Are there lessons for future major disasters? The fact is we were not as prepared as we should have been, and yes, we can and must learn from the 2017 disasters. The frequency of major storms is increasing. Ten Atlantic hurricanes formed this year, the first time we saw that number in more than a century. And of the four that reached U.S. soil, Irma and Maria reached Category 5 (the highest, with winds at or greater than 155 miles per hour), Harvey was a Category 4, and Nate made it to a Category 2 level. The U.S. National Oceanic and Atmospheric Administration tracks the cost of U.S. hurricane disasters, and the trends are clear. The number of billion-dollar weather-related disasters in 2016 was the second highest, behind 2011. Looking more long-term, the average number of these large disasters has doubled since 1980. And with the four hurricanes in 2017—Harvey, Irma, Maria, and Nate—total damages for a single year hit a new record, with a tally somewhere between $200 billion and $300 billion. The previous record (adjusted for inflation) was $161 billion in 2005, when Hurricane Katrina struck the Gulf Coast. The 2012 Hurricane Sandy damage totaled $70 billion. The increase in disaster costs cannot be dismissed as an aberration. Weather and climate are not the only factors resulting in an increase in damage costs. Rising population and development patterns—the number of people and buildings in the area of a disaster—are other factors. Whatever the reasons, the numbers and trends are clear. One lesson rings true in every major disaster—strong leadership in government when the disaster strikes is key. The Federal Emergency Management Agency is the lead federal response agency in preparing for, and responding to, the nation’s disasters. Having well trained, experienced, and dedicated staff at all levels is critical. Since Katrina, FEMA’s disaster preparation and response mission has received needed attention. Its leaders are consistently people with critical experience in disaster and emergency response, not just political appointees who learn the disaster trade after appointment. The current Administrator, Brock Long, came to FEMA after having led Alabama’s emergency management agency. His predecessors also possessed similarly strong backgrounds, such as former Administrator Craig Fugate, who headed Florida’s disaster agency. But FEMA is not on its own. Effective response to major disasters comes from coordination with the affected state and local governments, and other federal agencies. When FEMA wants to send generators, food, or medical teams, they request support from other federal agencies with the needed resources. The Department of Defense has transportation assets such as Army trucks and Air Force cargo planes, Health and Human Services has medical teams, and so on. However, FEMA cannot give orders to other agencies, only requests. That means working through the bureaucracies. Cooperation is usually very good, but there can be disagreements among the officials, slowing down response. More money alone will not solve everything, but what the recent trend in the cost of disaster recovery efforts tells us is we are not setting aside nearly enough money to help the impacted communities. Rather than recognize that multiple, large disasters are a major risk with a high likelihood of occurring each year, Congress does not allocate in advance the amount of dollars likely to be needed. When this money runs low, disaster recovery efforts across the country must be stopped, slowing the rebuilding of previously impacted communities, and delaying aid to survivors. And after disasters do strike, even with congressional representatives of the disaster areas understandably pressing for recovery monies, the budget process faces delays. Decisions about how much to allocate for disaster relief are often put off until days or weeks after disasters occur. It was 35 days after Hurricane Maria left Puerto Rico and the U.S. Virgin Islands that Congress passed a $36.5 billion hurricane relief bill with funding for these and other areas impacted this hurricane season. It’s not just Congress; the White House needs to recognize and act on the fact that multiple, catastrophic disasters are the new normal. More realistic budget submissions should reflect the actual cost of recovery, and the need for stronger, smarter preparations. Despite clear trends, the federal government continues to budget for catastrophic disasters the way it always has—allotting some portion of funds that are never enough to build the necessary capabilities needed to respond and recover from multiple catastrophic disasters. We can no longer operate this way. The federal government needs to recognize that more frequent hurricanes, flooding, fires, and droughts will occur. It is essential to plan for multiple disasters in a given year, sometimes within a short time span of a few weeks or days—American lives depend on it. Tim Manning served as Deputy Administrator of FEMA for Protection and National Preparedness from 2009 to 2017. Peter Tyler is a Senior Policy Analyst at the Project On Government Oversight.